Rob Kesselring was born in Schenectady, New York. He graduated from the University of Colorado, Boulder and earned a a Master’s degree in Organizational Development from the University of California, Santa Barbara. He lived nine years in the Canadian arctic where he was a teacher, registered wilderness guide and bush pilot. Rob has led 32 canoe expeditions in arctic Alaska and the Canadian arctic, one which lasted 14 months. In 2010 he led a six week 760-mile canoe trip without resupply researching the decline of the central arctic caribou herds. 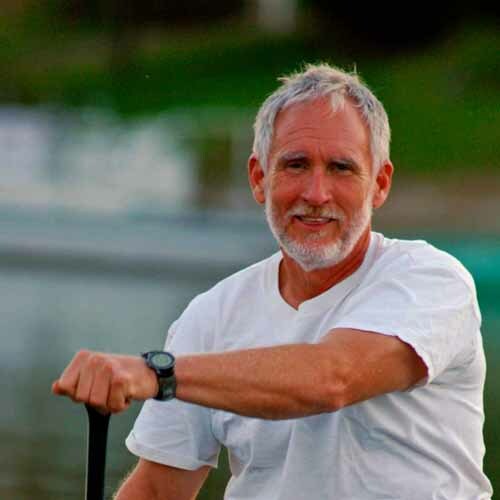 He has made 82 Boundary Waters canoe trips and has paddled over 120 rivers worldwide. He is a founding member of the Heart of the Continent Wilderness Partnership, a Quetico Foundation trustee and active in conservation and wilderness preservation efforts on planet Earth. Rob has written five books and dozens of articles for outdoor magazines and professional journals. Rob is the father of five daughters, each of whom he took on an extensive daughter/father, coming of age, canoe trip when they turned fourteen. He counts these as five of the top ten most meaningful adventures of his life. He enjoys canoe touring, freestyle canoeing, whitewater canoeing, nordic skiing, SCUBA diving and taking on new challenges.